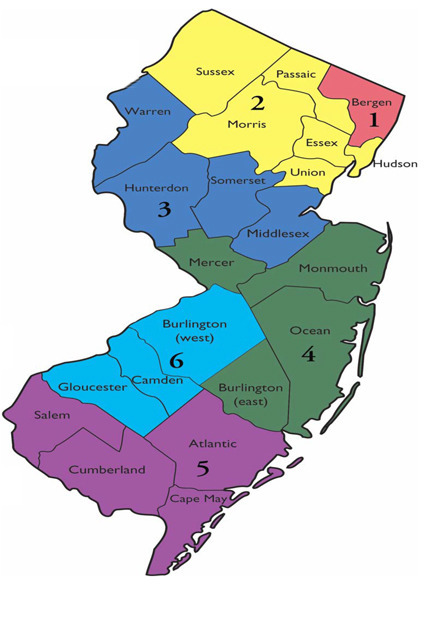 NJPhA is organized into 6 geographic regions that host continuing education programs and networking events, and communicate Association and industry news discussed by NJPhA leadership — the Board of Trustees, the CEO, and line officers. We organized locally to minimize your travel and to make it easeir for you to have maximum input on the issues and the activities most relevant to where you practice. But as usual, the sum of the parts is greater than the whole, so leadership works with regions to ensure that one very strong, unified voice represents you and your patients in Trenton and beyond. There’s nothing stopping you from participating in activities hosted by regions other than yours. With over 9 regional programs held already this year and more planned, we hope that you’ll see what activities are going on in regions outside of your home base. You can use the map below to identfy your region based on the county where you live.